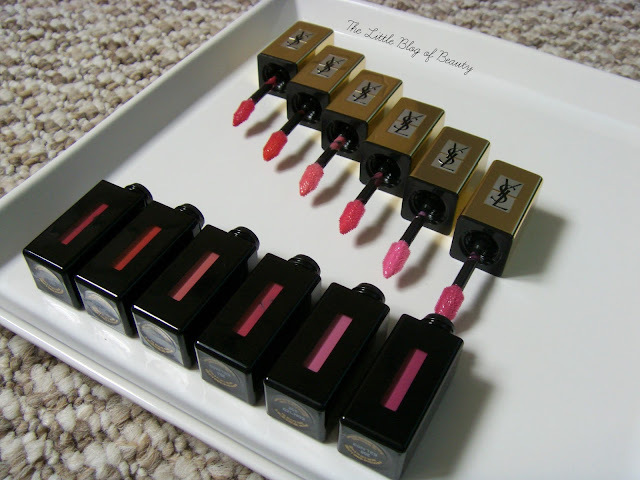 I was lucky enough to win all six of these YSL Pop water glossy stains (and three Full metal eye shadows) in a Dave Lackie competition. If you've not come across Dave Lackie before he's the beauty expert for a programme in Canada called Cityline, which appears to be their version of This Morning or something along those lines. Dave has a number of competitions running at a time, usually for high-end brands like Chanel, Dior and YSL, that require you to RT to enter. I know some people do get fed up of his competition tweets being RT'd into their timeline, but I'm quite picky about the ones that I enter, only going for ones I really would like to win. He's also started running some giveaways on his blog instead and that's how I won these, by just leaving a comment. As you can probably tell it was these photos (actually it was the one on my Instagram that started it off) that inspired my new blog header. I sent the picture off to the amazing Carly and described the sort of thing I had in mind and she bought the image in my head to life perfectly. Thank you Carly! I'm sorry these photos are a little dodgy quality wise. My poor old camera really is struggling to focus in it's old age and it's so old it's pretty low on megapixels too. I'm hoping to be able to pick up a new (cheap and cheerful) one soon as I don't think I can stretch to the more expensive one I have my eye on. Anyway, I have digressed. I received shades 501 through to 506. They don't appear to have names, which I think is a shame, but they would be French so I probably wouldn't be able to pronounce them anyway. 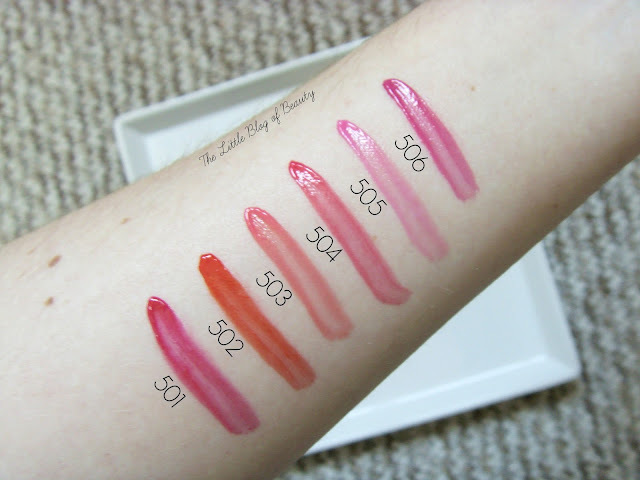 I find these to be like amped up glosses, I wouldn't go as far as saying they have the pigmentation of a lipstick (like the Bourjois Rouge Edition velvets) but have more than a standard lipgloss (similar to the Bourjois Rouge Edition Aqua Laques). As the name suggests they have a formula closer in consistency to water rather than traditional thick and sometimes sticky glosses. They come with furry type applicators and these are slightly titled which I think makes it easier to apply them. I don't find that it holds enough for both lips though so I do dip in again to do my top lip. 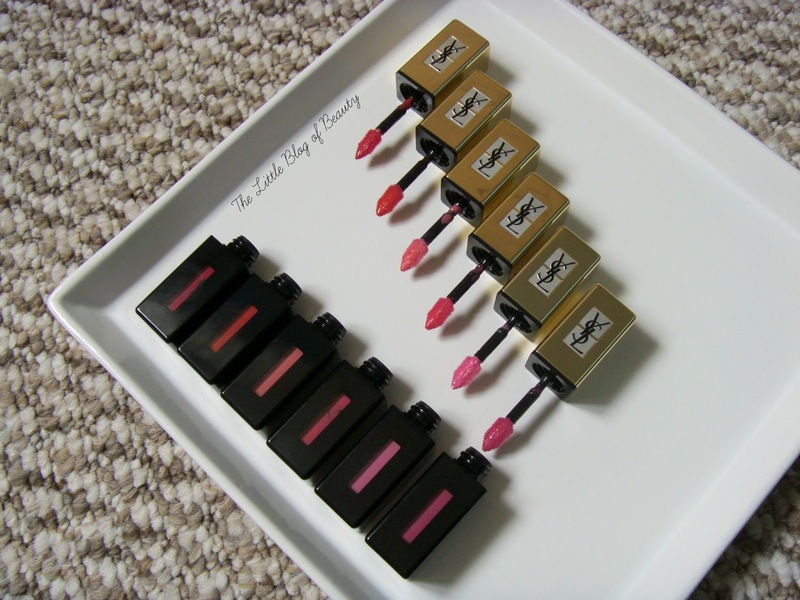 Although you don't have to be quite as precise with application as you do with a lipstick I like that you can use the tip of the applicator to help line your lips with a precise line. I haven't tried all of them yet but the ones I have tried I've found to have a nice formula that is light and water like and maybe just the tiniest little bit sticky. They become a little stickier the longer you wear them but this is far from sticking your lips together sticky. They're comfortable to wear and I don't find that they dry my lips out at all. Considering they are just glosses I find they last quite well and they do leave a stain behind on the lips. At £26 each I don't think they're something I would buy myself, as for that money I would much rather have a proper lipstick, but I'm glad I have them and can see me using at least half of the shades regularly. Especially if the heat we've been having recently sticks around as lipsticks have just felt too heavy. Are you a fan of water type glosses? 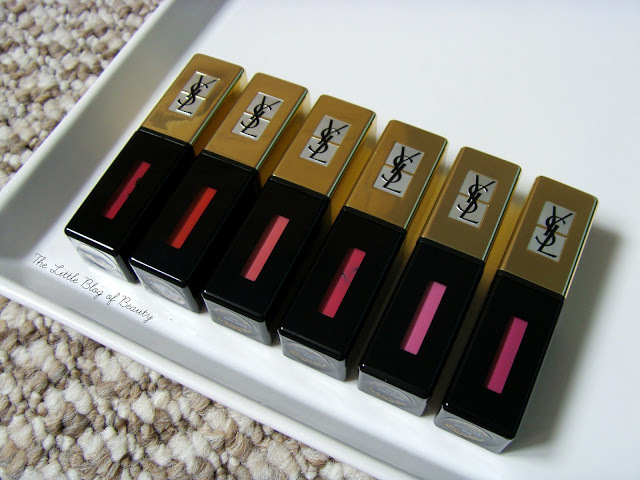 My love for YSL is strong and as much as I've tried to hold off on the pop water glossy stains, I don't think I will be able to much longer.